With the announcement of Oculus Touch controllers earlier this year, Oculus has been busy showing off what our hands can do with the Oculus Rift in virtual reality. Toybox is one demo that you can play if you're lucky enough to make it out to an event with Rifts laying around. Aside from a quick flash on the screen at Oculus Connect 2 a few weeks ago, the public hasn't seen much of it. 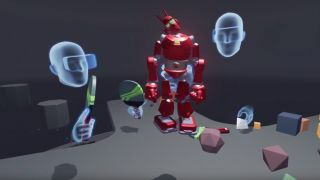 Oculus CEO Brenden Iribe recently shared a clip of Toybox that's the longest bit of footage the company has shown off publicly. Iribe captioned the video saying, "The new Toybox demo for Oculus Touch demonstrates the power of social VR. You can use your hands to poke at things, pull objects apart, stack blocks, and play games with other people inside a virtual world. This is just scratching the surface at what's possible. We're going to see so many new experiences that redefine how we think about computers, video games, and VR." Check out the video for yourself below. Aside from being a slightly creepy disembodied head, the demo itself is actually really fun.